Prudentius (born in Spain in 348, died after 405) was a Christian, a successful lawyer, and provincial governor. He subsequently rejected this worldly life, became a vegetarian, and turned his energies to writing. Of his writings the 'Psychomachia' (Conflict of the Soul) was illustrated many times during the Middle Ages. In it he deals with the subject of the internal struggle between good and evil in a particularly appealing and readable way, by treating the human virtues and vices as female figures in--often gory--conflict with one another. 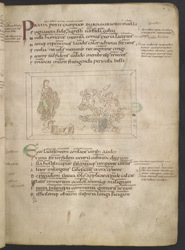 This copy was owned by the abbey of Bury St. Edmunds in the Middle Ages.